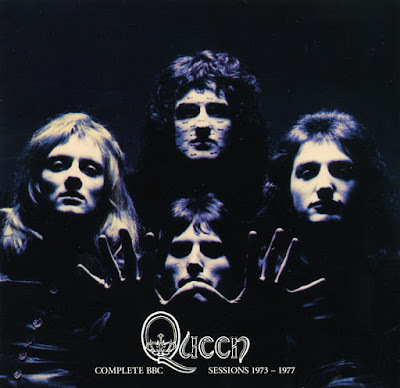 Recorded: BBC studio session 1973, 1974 & 1977. & 'Golders Green Hippodrome, London Sept. 13th. '73. Sound: Excellent stereo soundboard recording. 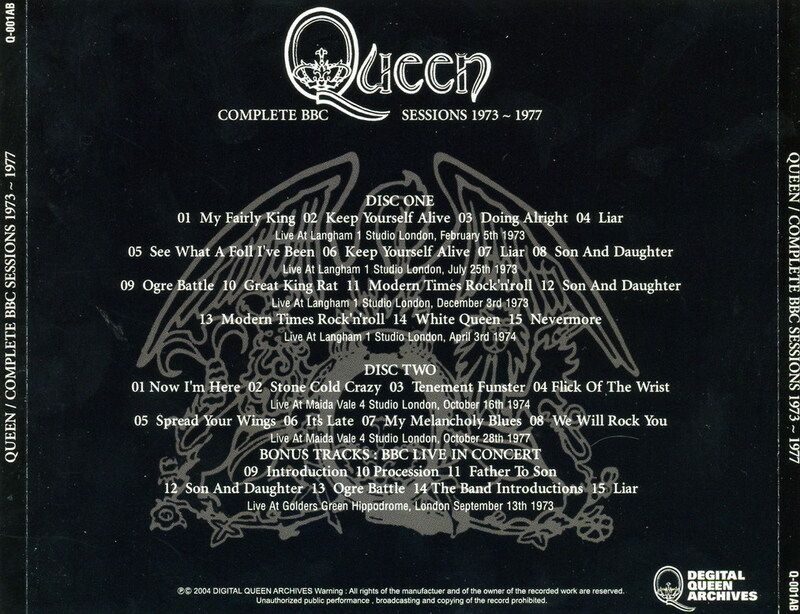 Track 5 can be found in the bonus disc of the 2011 Universal Records edition of "Queen II"
Track 15 can be found in the bonus disc of the 2011 Universal Records edition of "Queen II"
Tracks 3 and 4 can be found in the bonus disc of the 2011 Universal Records edition of "Sheer Heart Attack"
Tracks 5 and 7 can be found in the bonus disc of the 2011 Universal Records edition of "News of The World"
Enjoy and keep it lossles. Very nice 2cd with all the BBC sessions Queen have done. Only one tracks is missing 'The March Of The Black Queen'. But information I have got, is that this track is the same as the album version, that you can't actually heard any different between them. But, I can't confirm this information 100% true. All this BBC versions on this 2cd, sounds all a bit different to the ordinary album versions. The live tracks are from BBC 'In concert' program. Live Golders Green Hippodrome, London Sept. 13th. '73. just a wee question, where would the missing track "The March Of The Black Queen" fit in to this? 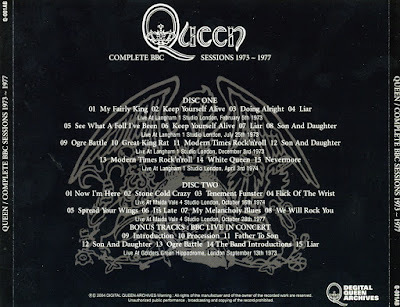 also everything on here has been released on Queen on Air in 2016 or on the Japanese releases In The Mirror (The Lost BBC Sessions) and In The Mirror Again (More Lost BBC Sessions) in 2011.